The gate was destroyed by a driver in April. THE HISTORIC FRONT Gate of Trinity College Dublin is to be repaired this week, two months after being destroyed by a driver. In April, a 68-year-old man was arrested after driving his car into the gate, destroying the 140-year-old wooden doors. The Front Gate was erected in the early 1870s as part of on-going refurbishment that took place in the College, replacing the original 1759 gates. After being damaged, the gate taken down by craftsmen from the Trinity College Buildings Maintenance Department and brought to the joinery workshops of Dunwoody & Dobson, specialist heritage building contractors. There, matching timber was sourced and the damaged sections of framing and panels were repaired or replaced. The original door frames are being replaced with new oak posts re-made to the same design. The surface finish of the remaining timber was stripped back to bare wood and the whole of the gate will be French polished to complete the process of restoration. The gate will be hung in seven pieces this week, with the completed job visible on Sunday. 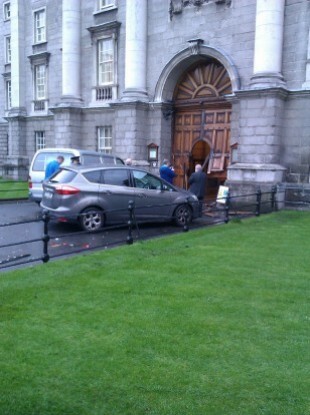 Email “Trinity College Dublin's Front Gate is to be repaired this week”. Feedback on “Trinity College Dublin's Front Gate is to be repaired this week”.